reduces noise level by an average of 15 dBA. This FTP helical gear pump is the ideal solution for low-pressure lubrication applications where low-viscosity fluids are required, such as fire-resistant fluids. Typical applications include large lubrication systems, lubrication of the guides of machine tools, and the lubrication and cooling of tools themselves. Fire-resistant fluids are used whenever there is a possibility that a hydraulic fluid (also used for lubrication) may encounter a source of ignition, such as the surface of very hot equipment. Fire-resistant hydraulic fluids are specially formulated so they are more difficult to ignite and do not propagate a flame from an ignition source. There are several types of fire-resistant fluids and they are generally classified as follows: oil and water emulsions, water-polymer solutions, and anhydrous synthetics. More specifically, the International Standards Organization (ISO) further classifies these fluids as follows: HFAE – oil-in-water emulsions, typically with more than 80% water content; HFAS – synthetic aqueous fluids, typically with more than 80% water content; HFB – water-in-oil emulsions, typically with more than 40% water content; HFC – water polymer solutions, typically with more than 35% water content (also known as glycol solutions, polyalkylene glycol solutions or water glycols); HFDR – synthetic anhydrous fluids composed of phosphate esters; and HFDU – synthetic anhydrous fluids other than phosphate esters. Examples include polyol esters and polyalkylene glycols. The only fire-resistant fluids that are completely incompatible with these gear pumps are the HFDR type; for all the others, it is possible to obtain a configuration that makes them compatible. To avoid fast wear of the sliding contact parts, FTP pumps can be supplied, depending on the type of application with bronze or bronze/PTFE thrust plates. 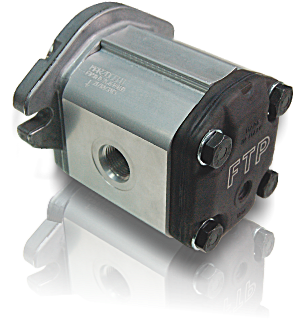 These FTP helical gear pumps are available in versions with or without a relief valve built into the cover, and maximum working pressure is 50 bar. The gear pumps have very high specifications for rotation speed and viscosity range. FTP pumps are currently available with clockwise rotation, with counter clockwise being developed, and all commercial versions of standard gear pump. The low number of teeth reduces the fundamental frequencies of the pump noise, producing less sound. The helical profile of the gears reduces pressure oscillations and vibrations produced by the pump and transmitted to the other components, reducing the noise of the hydraulic system. 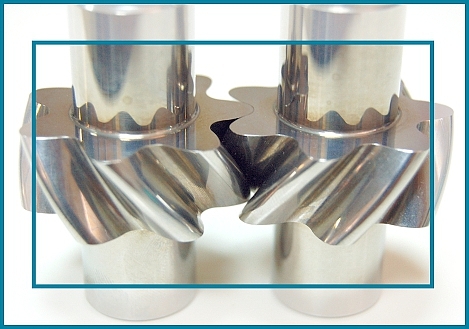 Axial forces induced by the helical teeth are optimally balanced in all operating conditions by the axial compensation system integrated in the pump cover. » Lubrication of the guides of machine tools. » Lubrication and Cooling of the tools themselves. » Applications using fire-resistant hydraulic fluids. » Displacements range 7 - 35 cc/rev. » Threaded ports: G1" (FG) or 1 5/16-12 UNF (FA). » Several types of standard Flanges and Shafts. » Maximum working pressure: 50 bars. » Available with or without relief valve (VM). » Special version for low viscosity fluids available on request. Link for further information about helical gear pumps; Elika the low noise, high efficiency helical gear pump.